Christmas blows. But you know what doesn’t? Making a gingerbread house. 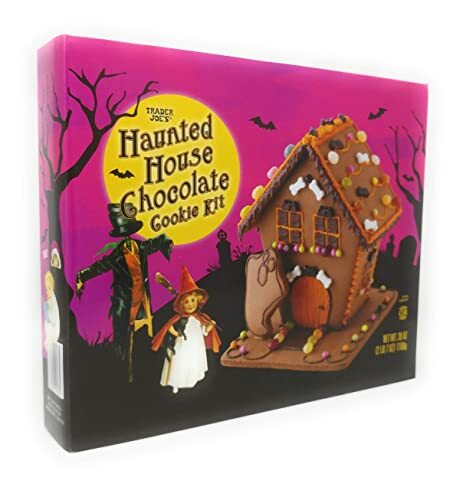 If only there was some sort of haunted cookie house made especially for Hallo- ……….wait a minute. Holy heck. The nostalgia and fun of building a gingerbread (in this case chocolate cookie) house, but with bats, bones and ghosts instead of gumdrops and candy canes? Yes yes yes. Are you excited too? Keep scrolling and build a haunted cookie house with me! The kit includes everything you need to scare up a haunted house. We have precut walls, a roof, and a base all with traceable lines for details like shingles, door and windows. There’s a sweet cookie ghost, black and orange icing, and candy accoutrements including bones and bats. Get your pieces ready and your kitties off the table. I thought lining the base board first would be a great idea. It’s not. Don’t do it. Save it until you’re putting up the house. Make your front and back walls instead! Line those doors and windows and put up some decorations. Please don’t mind my poor battered fingernails. You can’t help either, Joe. Go sit with Dumpster. Time for the side walls! But…uh oh. Now that everything’s decorated, put the icing on your baseboard and try to stand this bad boy up. After a long stream of cursing, icing, and judgemental cats, we have a house that is dubiously standing. What a disaster. Maybe it’ll look better once we get the roof on. I shall call you Gappy. Haunted houses are supposed to look dilapidated right? All in all, if you don’t look at too close, it’s not terrible! It was fun, inexpensive and I’ll definitely enjoy looking at it until it either starts attracting ants or the cats knock it down. This would make a great gift for a tiny human or a really fun thing to do at a Halloween party with a scary movie on the TV and a drink in your hand. Would you make this for Halloween? Think you can do better than I can? (I do too…) Drop a comment and leave a picture of your favorite Halloween crafts.